Parishioners, alumni, students, parents, teachers and local politicians filled Our Lady of Grace Church, Howard Beach, to celebrate a Mass renaming Ave Maria Catholic Academy (AMCA) as Our Lady of Grace Catholic Academy (OLGCA). As one of the first schools to adopt the academy structure almost 10 years ago, Our Lady of Grace was asked to rename its school. 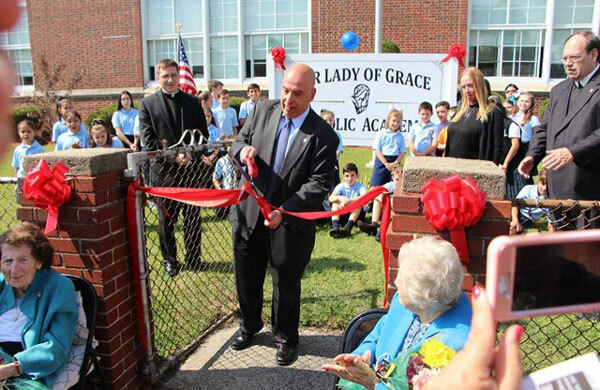 As new academies have been able to keep their given name and add “Catholic Academy,” the Board of Directors petitioned Bishop DiMarzio and was granted the permission to return the school to Our Lady of Grace. The celebrant of the Mass was Father Marc Swartvagher, pastor. Deacon Alex Breviario assisted at the altar. The theme was past, present and future. Alumni and students participated as lectors, gift bearers and choir members. Following the Mass, a ribbon cutting ceremony was held outside the school, honoring two alumnae, Breeda Connolly and Margaret MacKinnon. Sue Murray, MacKinnon’s daughter and an alumna, explained that her mom and classmate Connolly had unique memories. Surrounded by current students in their new uniforms, Brother Ralph Darmento, F.S.C, diocesan deputy superintendent of schools, was joined by Mitchell R. Weiss, chairman of the board of OLGCA, who had the honor of cutting the ribbon. Organized by Doreen DeCandia, fundraising chairperson and an OLGA parent of four children, the festivities continued in the school auditorium that was decorated with the school colors and blue and white balloons. Playbills from past theatre productions, report cards, yearbooks, other memorabilia and graduation photos and testimonies from former and present students adorned the walls. There was a movie playing celebrating 100 years of OLG history. I graduated from OLG IN 1961. I lived across the street. This was a “ family community “ then. What wonderful experiences were had by every Student. Will never forget OLG. I was was Married on October 22, 1966 from OLG Church. Beautiful day, Beautiful Church.